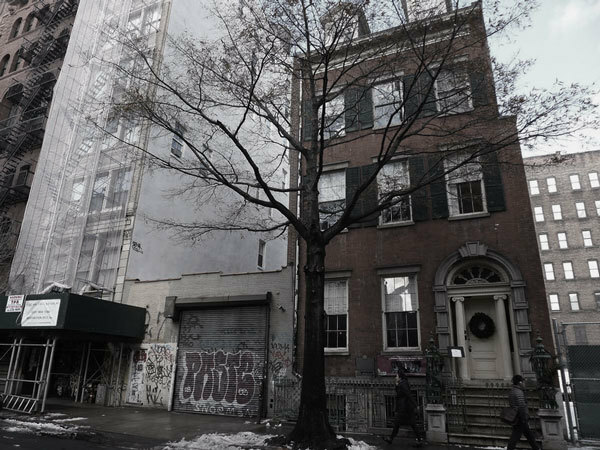 The Merchant's House - located in the bustling East Village on 29 East Fourth Street in Manhattan, New York City - is known to be the most haunted house in the entire city. So, naturally, they would have plenty of things to do around the Halloween season which they call "Spirited" events. 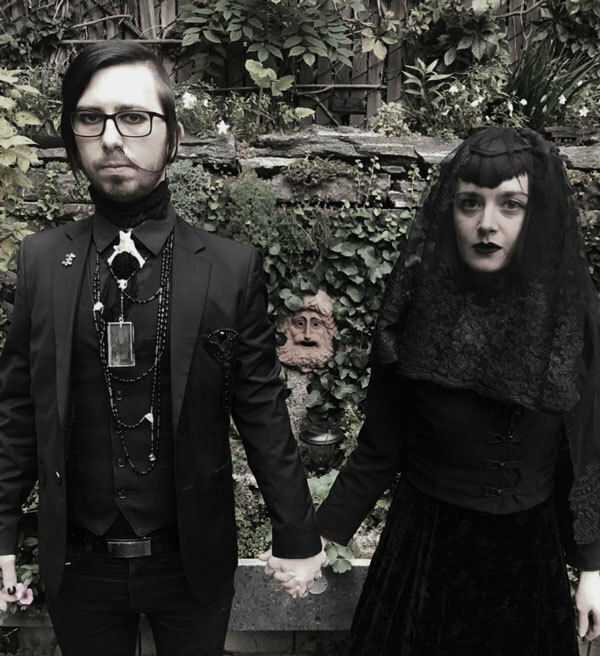 From candelight ghost tours to "Tales from the Crypt: Horror on Halloween" (dramatic readings of our favorite dark Gothic literature from the 19th century), the Merchant's House certainly knows how to spoil a goth. 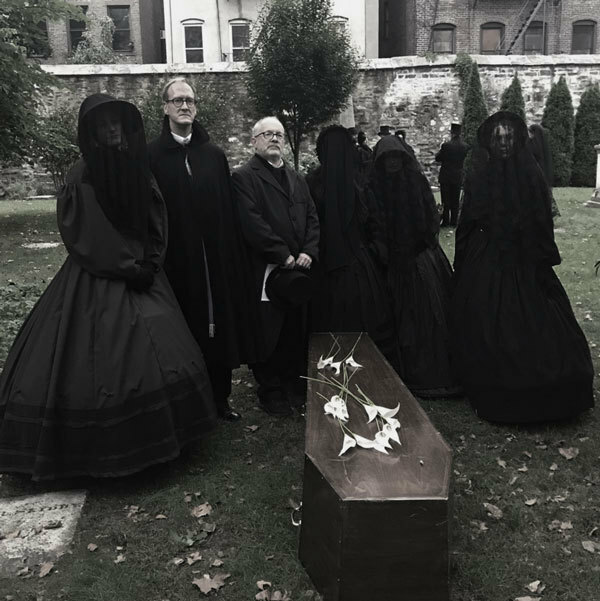 I was particularly enchanted by the event "From Parlor to the Grave: 1865 Funeral Reenactment and Graveyard Procession" that was being held on a Sunday afternoon. 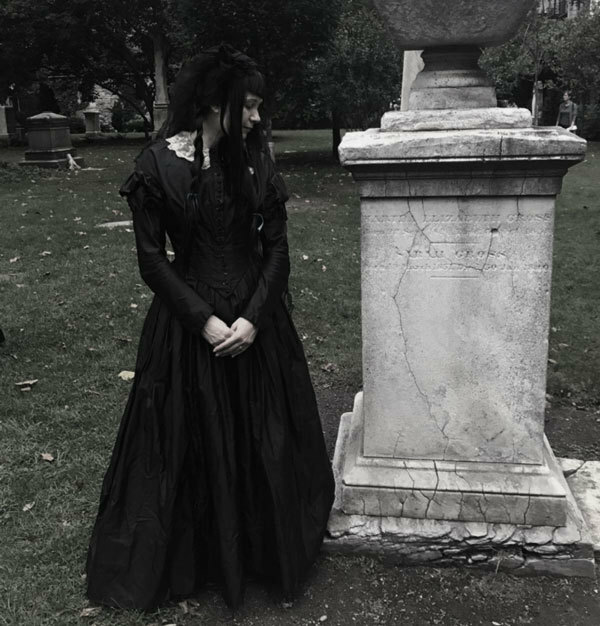 The event was an opportunity to see the house, attend a Victorian customary funeral and walk in a procession down the streets of Manhattan to the famous Marble Cemetery. 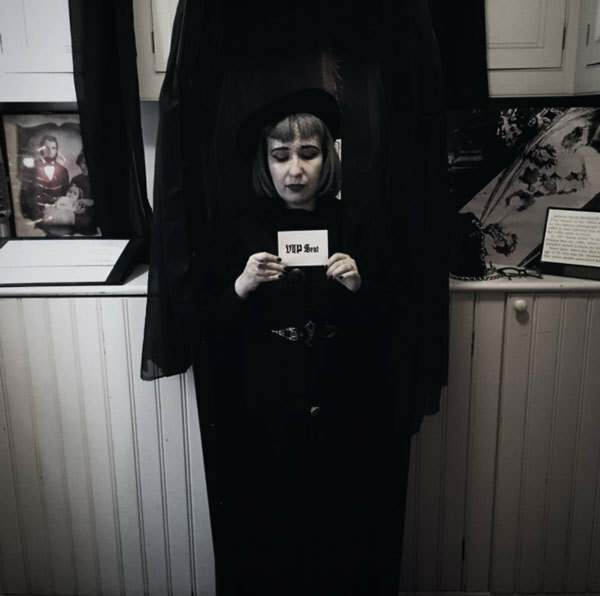 There was no hesitation in inviting my most fabulous of goth friends and we gathered to celebrate the life of Seabury Tredwell, who lived in the house in the early to mid 1800s. If you follow us on Instagram you might have seen our live feed from the event - here is my recap of the wonderfully spooky Sunday afternoon with the Merchant's House. The house, which might look a bit out of place these days, is located on a busy block in the East Village. My friend and I knew right away we had arrived as there were a slew of ladies dressed in authentic Victorian mourning dresses! We were in the right place! 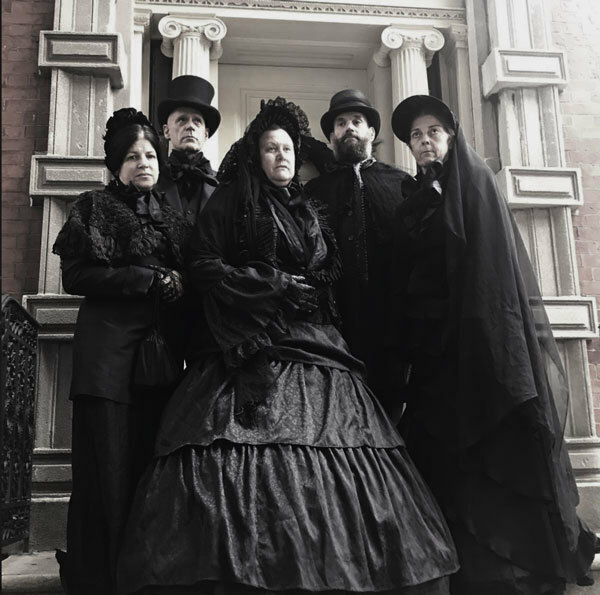 On the Merchant's House website, they urged participants to dress in the best Victorian mourning outfits - and the mourners didn't disappoint. I've never seen so many intricate outfits and wonderful accessories. 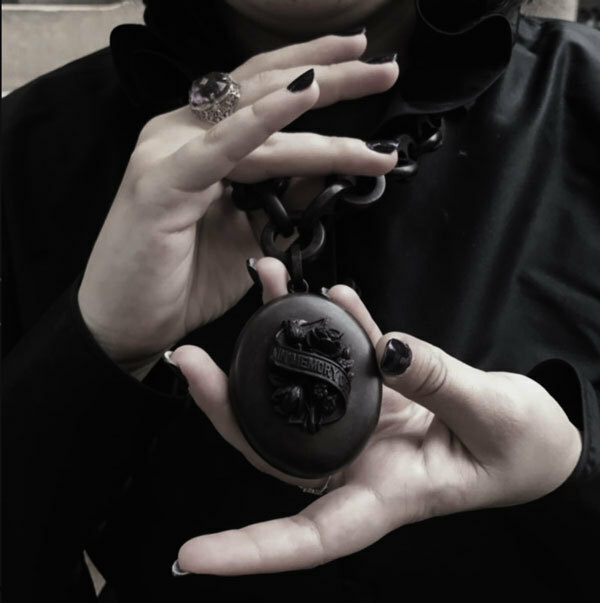 My favorite piece of jewelry was the 1880s vulcanite locket necklace which read "In Memory Of". 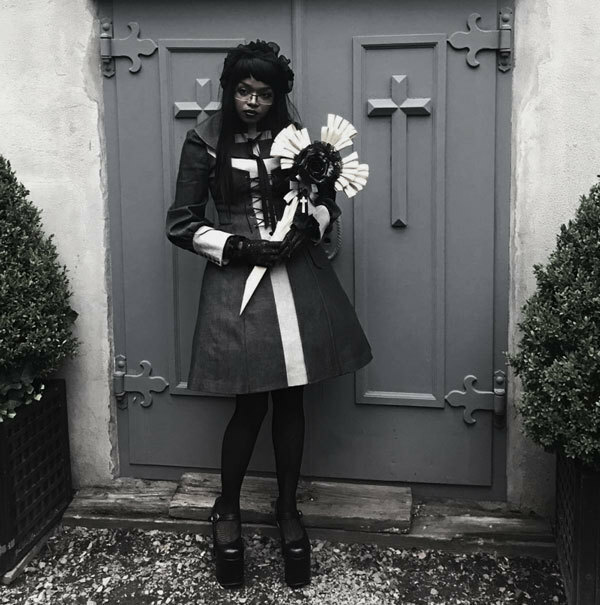 Is this a funeral or a beautiful goth wedding? When the Merchant's House opened at 4, we shuffled in and took a look at the house and its wonderful backyard garden (perfect for photos, you know). 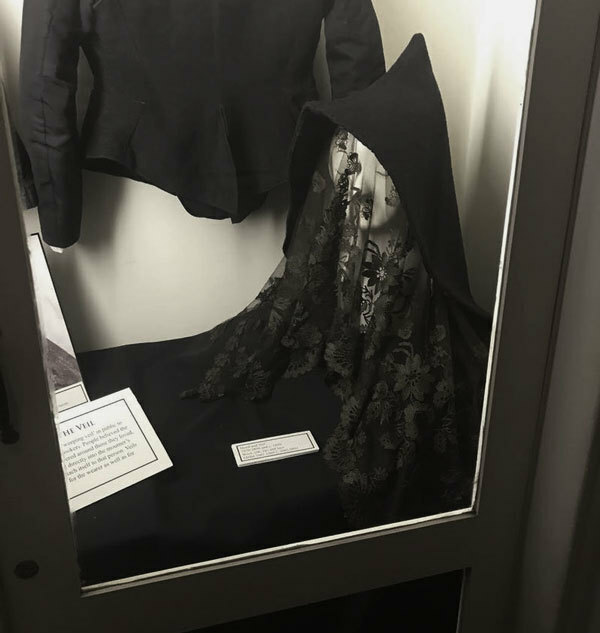 I was so in love with this mourning hood and veil combo! There was also an antique casket, another photo opportunity! Actors dressed in mourning attire walked down the aisle and situated themselves beside the casket in the dim-lit room. Victorian mourning custom required that all windows and mirrors be covered with black crepe so no light will emanate through, and also so that no spirits will be stuck in between worlds. The pastor then read from The Bible and we sang "Nearer My God to Thee", a traditional hymn from the time period. After the service, we left the Merchant's House and followed the casket carried by four men with the Tredwell family following behind, clutching lillies. 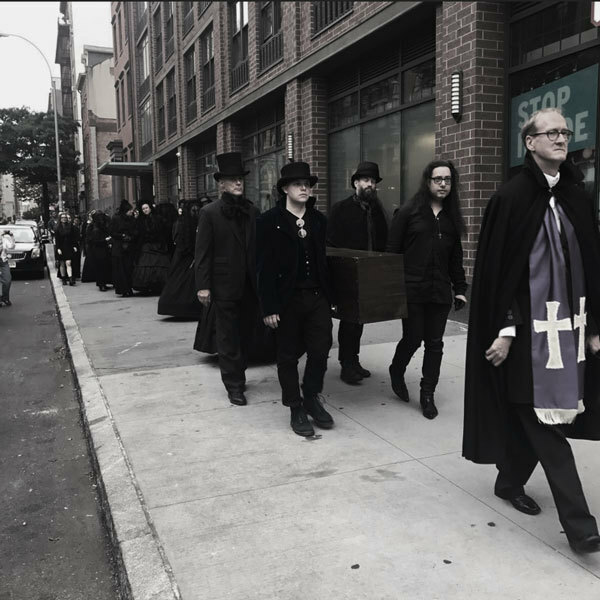 The group of us, all clad in black and many of us in traditional mourning garb, caused quite a ruckus as we walked solemnly through the East Village. Tourists and natives alike stopped and photographed the procession, all with a confused look on their face - you can only imagine such a scene! Once we arrived to the New York City Marble Cemetery, which was about a 7 minute walk, we gathered around the casket and lillies were placed on top of it. The cemetery rarely opens its gates for visitors, so this was a treat! I HEARD a voice from heaven, saying unto me, Write, from henceforth blessed are the dead who die n the LORD ; even so saith the SPIRIT ; for they rest in their labors. Those muted colors against the silvery blue door is so heavenly! How could this possibly be NYC in 2017? Hard to believe! I recommend visiting the Merchant's House whenever you're in NYC and look for similar events where you live as well! Would you attend this event next year? Comment below! Wave Gotik Treffen 2017 Music: Rotersand, VNV Nation, The 69 Eyes And More! Join 2m+ Rebels who already love our content.